Read more about Reconciliation Week at the University of Sydney. The music of a little-known Indigenous country music singer has been brought to life through the research of University of Sydney postgraduate student Toby Martin, who is also lead singer of the band Youth Group. Martin will receive his PhD, which focused on the history of Australian country music, from the Department of History on Friday, while continuing his work at the university as a research assistant in Richard White's ARC Discovery Grant project on tourism in Australia. While investigating Australian country music for his PhD, Toby came across the music of Dougie Young, an Aboriginal songwriter who lived in Wilcannia, in outback New South Wales, during the 1950s and 60s. A research interest in Dougie's songs soon led to a musical interest, and Martin formed a band with Dougie's grandson to give the songs a new lease of life. 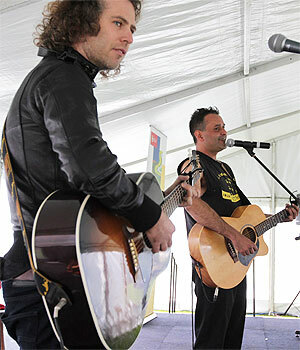 Martin performed an acoustic set with Jimmy James, Dougie Young's grandson, as part of the Reconciliation Week series of events at the University of Sydney on Monday. "Dougie Young is a cult figure to some - particularly within Aboriginal communities - but he remains unknown to a broader audience," says Martin. "This is a real shame, as his songs have a lot to teach us about our past - not just past injustices, but also past forms of social protest and the circumvention of establishment and authority by Aboriginal people." The main sources of information on Dougie Young's songs are field recordings made by anthropologist Jeremy Beckett during several visits he made to Wilcannia in the 1950s and 60s. Beckett taught at the University of Sydney from 1966-1994 and is currently an Emeritus Associate Professor. Martin's journey to Wilcannia originated in his PhD project on the history of country music in Australia, supervised by Richard White in the Department of History. His research also earned him the 2010 John Ferry Award for Local History from the Australian Historical Association. His article 'Country music capital: the past in Tamworth' was published in a special popular culture edition of History Australia. Wilcannia in the 1950 and 60s was largely divided between the whites who lived in town and the Aboriginal people who lived on the government mission and on the banks of the Darling River. "The Wilcannia Aboriginal community was a lively one," Martin says. "There was a lot of music, especially country music." A central figure on the local music scene was Dougie Young, who wrote and performed songs about life in town at the time. A topic of particular interest was alcohol, which was then illegal for most Aboriginal people. "Young's songs described life for an Aboriginal man in Wilcannia with wit, verve and extraordinary immediacy," says Martin. "This was a life where if you wanted to 'cut a rug' with your mates then you would end up 'in the clink' as a result. The law that banned drinking wasn't repealed in New South Wales until 1964." Martin maintained a particular interest in Dougie's music after being named 2011 National Folk Fellow by the National Library and the National Folk Festival, which granted him access to the library's vast collection of field recordings to create new performances. He then formed The Rug Cutters to perform Dougie Young's music. The band includes Jimmy James (Dougie Young's grandson) on vocals, ARIA-nominated Jason Walker on steel and electric guitar, Patrick Matthews (also of Youth Group) on bass, and Neville Anderson on drums. "The Rug Cutters re-imagined Dougie Young's songs as electrified country: the way in which the songs may have been recorded had Dougie gone on to establish a career in white Australia," Martin says. Along with Martin and James' performance at the university on Monday, the group has performed at the National Folk Festival in Canberra and at Redfern's The Block.